On the heels of his executive order on the proposed border wall, Donald Trump issued a veiled threat, in an early morning tweet, to cancel a meeting with Mexican President Enrique Peña Nieto. 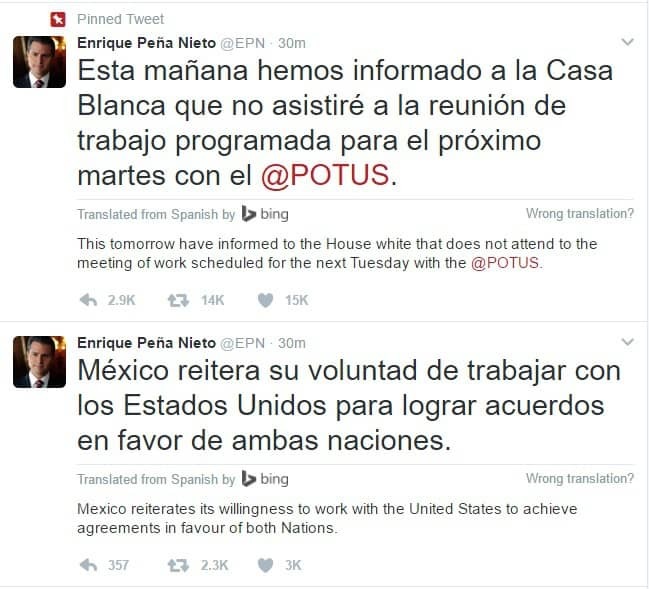 Peña Nieto responded later in the day by announcing, via his own Twitter account, that he had called Trump to cancel their planned meeting. As we have noted previously, Trump has no way to make Mexico pay for the wall, and he now risks damaging diplomatic relations with a nation which holds considerable leverage as a trading partner. President Peña Nieto's response figures to sting Trump, and only time will tell how he responds in full.